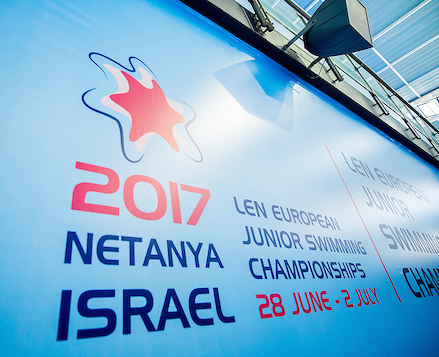 Hungary kicked off the European Junior Swimming Championships in Netanya with two golds, two silvers and a bronze but even more remarkably nations without too much experience in enjoying swimming glory, like Serbia, Ireland and Turkey, could also celebrate fine wins. The first title, the women’s 400m IM, landed in Serbian hands as Anja Crevar led from the very beginning and won with a two seconds gap. In the other 400m event of the opening day, in the men’s free, Akos Kalmar from Hungary took over the lead at the 150m mark and never looked back, enjoying a 1.69sec winning margin (here the Magyars did a 1-3 finish). Hungarian hero of the 2016 edition with four gold medals, Ajna Kesely just began another great march by retaining her 800m title, while cracking the Championship Record. A bit rarity at major swimming events but it happened in Netanya: the Turkish and the Irish anthems were played after the respective dash events. Uemitcan Gueres won the men’s 50m fly while Mona McSharry touched in first in the women’s 50m breast. The Polish quartet was the fastest in the men’s 4x100m relays, 0.49sec ahead of the Hungarians, while the same event saw the Russians coming first, with an even more comfortable difference of 1.31 seconds.